I had a very good first impression when we first stepped into Palm Breeze Cafe. It had a very nice and cosy ambience, friendly staffs, and our table was prepared within seconds. Upon glancing the menu, I was impressed with the wide arrays of cuisines they offered. They have pretty much everything from the Mediterranean to Western dishes. 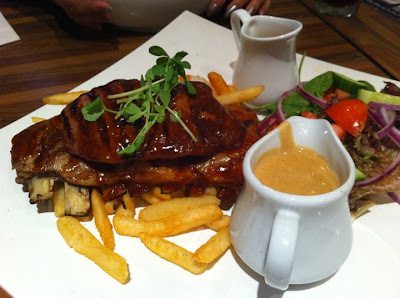 After looking around for a few minutes, I decided to taste their Scotch Fillet and Ribs combo. I was fully aware that by doing this, I was ready to directly compare the café with household names like Kelly’s and Hurricane’s. I pictured the combo would be of similar size of Hurricane’s because other steaks that went past me were huge. However when it came, the steak and ribs were tiny. I only got a rack of lamb ribs and a very tiny slice of Scotch Fillet. The fillet was cooked nicely but the ribs were quite bland. The other main that I tasted was Vitello Oscar. It is grilled veal with creamy garlic prawns on top. It had the best presentation for the night. The cheese would melt right through the prawns and veal. The prawns were really nice but the veal was a bit overcooked. The next two that we ordered from the menu, I did not really taste as my friends ordered them. The first one was Moroccan Chicken Salad. It was a quite colourful salad and had a quite big portion. 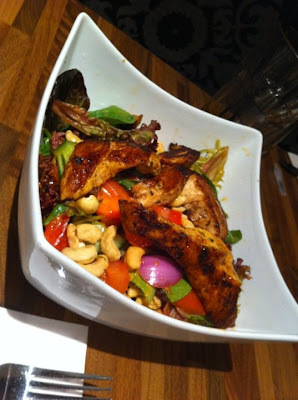 In addition to the usual salad, they also put in onions, cucumbers, cashew nuts, and Moroccan-style grilled chicken. The other one was Schnitzel Parmigiana. It was the least interesting plate of the night. 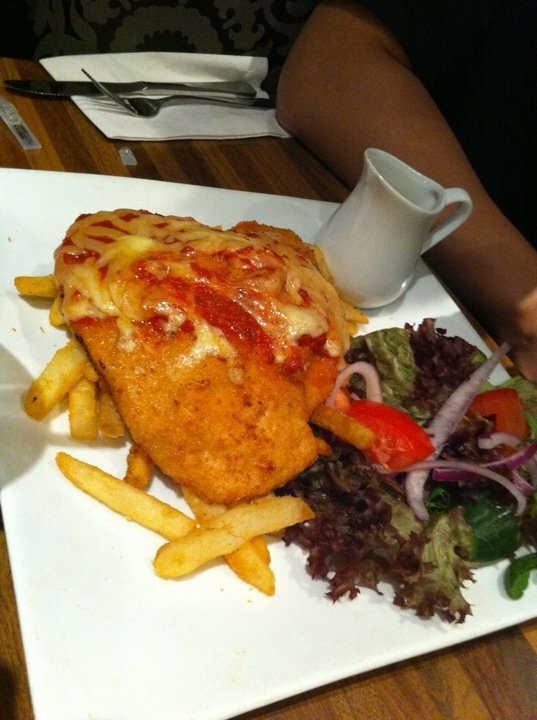 It was practically a chicken schnitzel with a little bit of cheese and sauce on a bed of chips and salad. 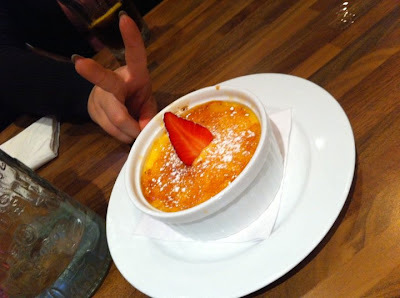 For desserts, the five of us picked two of our most favourite desserts: Crème Brulee and Tiramisu. Again, presentation wise, the two desserts were above average. They really stimulated our curiosity. However, upon tasting, we found that the crème brulee’s caramelised top was too thick and the layer of cream was also too thick. 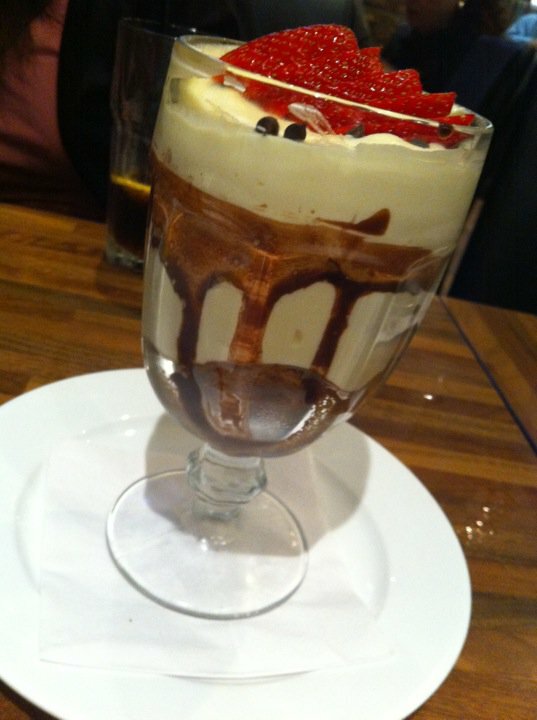 We had similar experience with the Tiramisu lacking the ‘memorable’ taste. The final verdict: It was a nice place to spend the night. The food presentation was really nice. In terms of flavour, it lacked the wow factor that made me want to return to try other stuffs on the menu and was kind of par rating. 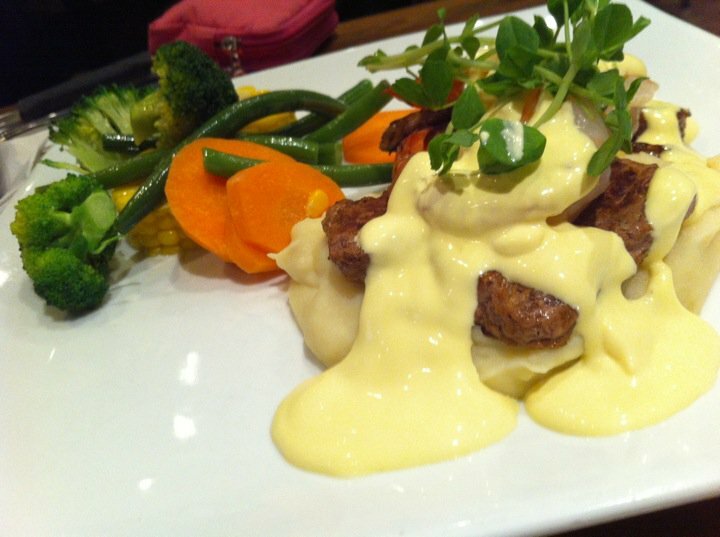 This café is located in the Sydney’s suburb, Burwood. It is one of the first suburbs that I am familiar with due to the fact that my game store is located there. It is also home of the last destination of Sydney’s longest bus service route 400 (In my opinion). The bus goes from Bondi Junction – Randwick – Maroubra – Eastgardens – Airport (Domestic & Int’l) – Rockdale – Campsie – Burwood. Six times (or more) the travelling time of trains or cars!